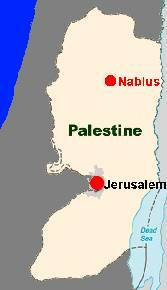 It is your donations which can make a positive difference to the lives of people in Nablus. Please give whatever you can, whenever you can. We really appreciate a monthly commitment because (for example) it will help to fund a student through to the end of their course. All donations help the people of Nablus and surrounding areas. There are many ways to support FONSA. What suits you? This is a convenient way for you to donate with a debit or credit card. Follow the link to make a donation. If you can, please make a monthly donation so that we can sustain our projects. But choose whatever suits you. You can make monthly donations online (see above). Or you pay through your bank; please use our donation form which includes a Gift Aid declaration (if you are eligible). Please either set up the payment through your online banking or fill in the "Standing Order" part of our form and we will process it. If you are a UK taxpayer please tell us so that FONSA can reclaim the tax you paid on all your recent and future donations. 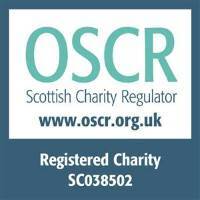 Please notify us if you stop being eligible to gift aid your donations. Whether you want to organise your own event, participate in an existing event, or raise money in memory of a friend or relative, we would welcome your efforts. You will find this easier if you make use of our pages on the Virgin Money Giving web site. Here you can create a page for your event and get people to pay their sponsorship directly to FONSA including Gift Aid. 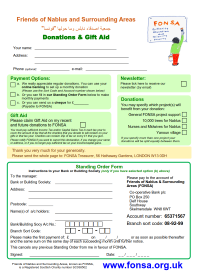 We also welcome cash donations and can help you by providing suitable forms for donors to fill in. This link gives full details of how to set up the pages you need. Please contact us if you would like advice or need to discuss anything. See also our page on sponsorship.